The Irish Red Cross contributes to the overall mission of the Red Cross Red Crescent Movement worldwide in preventing or alleviating human suffering wherever it may be found. 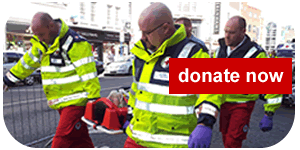 We support emergency response, recovery and longer-term development through the provision of specialist personnel or financial assistance in cooperation with Red Cross partners. We help reunite families torn apart by war, natural disaster or forced migration. We actively promote respect for human dignity through the dissemination of International Humanitarian Law.